So what does our new Attorney General Eric Holder mean when he says that we are "a nation of cowards" for avoiding "frank conversations" about race? The meanings we intend often correspond only fitfully to dictionary definitions. If someone asks "Do you have the time?" technically it would be answering the question to just say "Yes" and walk on. But there is a convention that "Do you have the time?" is taken as a request for the time to be shared. Calls like Holder's that we need to have "conversations" about race are coded in the same way (a book-length example of the "conversation" conviction is Beverly Daniel Tatum's Can We Talk About Race? published in 2007). Nominally, a conversation is simply an exchange of impressions. What people taking Holder's line mean is something more specific. One might ask them: To what extent will this conversation entail whites saying that they are tired of being called racists and being policed for ever more abstract shades of racist bias, with blacks acknowledging this and resolving to do it as little as possible? Many would answer "not at all," others "very little." Virtually no respondents would see the "conversation" as incomplete without the above. Now, we might ask the same people: To what extent will this "conversation" entail blacks teaching whites about institutional racism, ensuring them that black people still experience racism, and that our having a black president doesn't mean that white people are "off the hook?" I suspect most would answer "to a massive extent," and that the vast majority of respondents would see the "conversation" as incomplete without a substantial degree of the above. This would embody the lion's share of the "frankness" in this conversation, presumably. After all, if Holder were really interested in a "conversation" on race, he would understand that America is engaged in one year-round. The claim that America "doesn't want to talk about race" is hardly uncommon, and has a dramatic tang. However, take the past few years: Don Imus, Michael Richards, Jena, and of course, the coverage of Barack Obama's campaign, which included white reporters diligently smoking out whites who insisted they wouldn't vote for a black President. A Martian observer--or a modern Tocqueville--would readily see that America was rather obsessed with race. Certainly we are an America ardently "conversing" about it year-round. What Holder wants is not a conversation but a conversion. 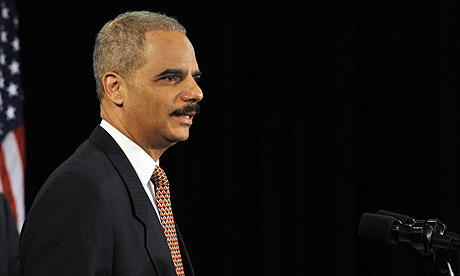 Holder allows that race is addressed "politically," but regrets that we do not "talk" about it one-on-one. Never mind that it is unclear how we know what people are not talking about nationwide. More to the point, Holder would presumably be unsatisfied by exchange as it happens among real people, in real life. He accuses whites of being "cowards" on the subject--though clearly no one would fear exchange in itself ("Gosh, I don't know if I can handle talking about Jeremiah Wright"). The conversations, then, are supposed to be teach-ins. This idea of a "conversation" (conversion) on race forever just out of reach is interesting in an intellectual sense. However, all evidence is that the only conversation that's going to happen already is. It is a sometimes messy exchange, conservative and liberal going head-to-head, gradually settling on a centrist position. Namely, racism must be reviled, the government can do things to help people, but much of what ails black people today is too abstractly connected to racism for whites to feel guilty about it anymore. That centrist position is no longer heresy among an ever-growing number of blacks or whites, and is underscored by a black man running the United States. The idea that black uplift requires a Very Special kind of "conversation" in 2009 entails a hothouse fragility antithetical to any coherent conception of black strength. This was highlighted the morning Holder made his speech, as Al Sharpton was planning a protest against The New York Post for a cartoon in which a policeman comments, upon seeing the chimpanzee who mauled a woman in Connecticut shot dead, that now someone else would have to write the stimulus bill. Sharpton thinks the implication is that Barack Obama is a chimpanzee. Obama did not, himself, compose the bill, of course. But besides that, if George Bush were still at the helm, Sharpton would have been otherwise engaged Wednesday morning. The issue is, as always, that we have to so very, very careful when the descendants of African slaves are involved. It is unclear to me what purpose this brand of sensitivity serves. You must joke with us delicately. You must engage in ticklish "conversations" with us about what's wrong with you. So delicate we are, so freighted with legacies, ever blinking in the light. This is what Black History Month is for? I suspect those who call for this "conversation" know the claim has become more gestural than concrete. Otherwise, they would state their case directly rather than asking to "talk." Really, who is imagining a goal, an endpoint after this "conversation"? What, or who, would determine that we had finally "talked" enough? If white people are cowards for not wanting to be called racists, there is a fear as well in people like Holder. It's not pretty to face that black people will excel, like everyone else, under less-than-perfect conditions. This "conversation" would be social history playing out quite perfectly--but history is never that consummately fair. The Civil Rights revolution was close enough to perfect, and Barack Obama's election was even closer. Now, it's time not for a callisthenic "conversation," but for making our way in reality.